He was a stubborn foe who never got tired or bored of arguing with us and never convinced with Quranism at all. Arguing with us at the mosque, in Cairo, was never enough to him; he visited us at home unexpectedly. Meanwhile, we were reading and writing while listening to a song in the radio sung in the melodious voice of the Lebanese diva, Fayrouz, and the song title was "Shadi Is Lost". We welcomed this unexpected visitor while hiding our annoyance for his not telling us beforehand about his coming. His face showed deep hatred to the voice of Fayrouz, as extremist Sunnites consider listening to singing and music as a sin, and we promptly and tactfully switched the radio off, preparing ourselves to a long session of fruitless argument that would waste our effort and time. Typically, after we have used the Quranic verses to refute all hadiths he quoted in his attempt to make us 'return' to the Sunnite religion, he was not convinced at all. 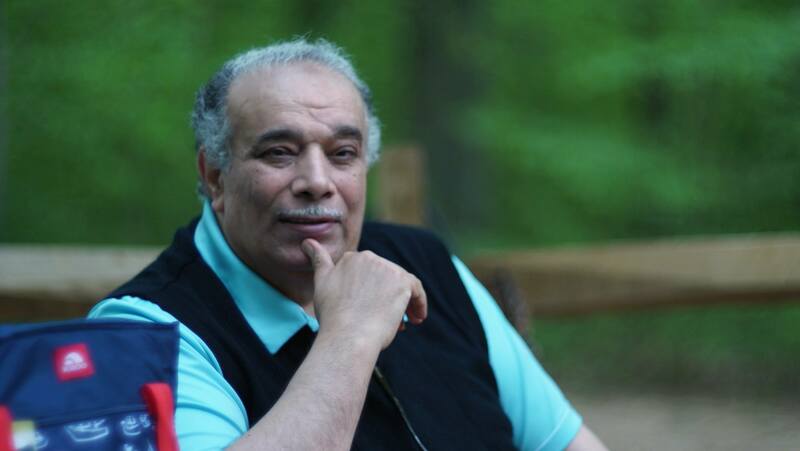 He was sitting with us in our office at home, and we opened for him many Sunnite books he worshipped so that we quote from them words that insult God, the Quran, and Muhammad, and he was infuriated as his views were debunked and he could not resist any more in such heated argument. We made him lose all lines of defense, except one that we know very well; to turn the attack on Quranism to an attack on our person, like many others typically have done when they could not refute us or could no longer argue. At first, we thought that he would not attack us personally by his words since he was our guest at home, but he asked us with hatred mixed with mockery that we are never to be trusted as a knowledgeable person in Islam because we commit the sin of listening to music and singing, especially Fayrouz! This would, for him, cast doubt on our stances and views! We in our turn asked him about how he knew that listening to singers, Fayrouz or any other, is prohibited in Islam. He fell silent in astonishment and could not reply, and we seized this chance to go on with our line of argument while he listened to us in utter amazement. We said to him that prohibited items are exceptions mentioned only and exclusively in the Quran; the general rule is to allow all things except the ones mentioned in the Quran as illegal. Thus, prohibited items must be deemed as such only through a Quranic verse, because God is the Only Owner of religion and its Sole Legislator: "Or is it that they have partners who legislate for them religious laws never authorized by God?..." (42:21). It is strictly prohibited in Islam (i.e., the Quran) to prohibited what God makes as legal and lawful, as this is a violation of God's right to be the Only Legislator in Islam: "O you who believe! Do not prohibit the good things God has permitted for you, and do not commit aggression. God does not love the aggressors." (5:87). We said to him that the major prohibitions in Islam (i.e., Quranism) are detailed in the Quranic Ten Commandments in these verses: "Say, "Come, let me tell you what your Lord has forbidden you: that you associate nothing with Him; that you honor your parents; that you do not kill your children because of poverty-We provide for you and for them; that you do not come near indecencies, whether outward or inward; and that you do not kill the soul which God has sanctified-except in the course of justice. All this He has enjoined upon you, so that you may understand." And do not come near the property of the orphan, except with the best intentions, until he reaches maturity. And give full weight and full measure, equitably. We do not burden any soul beyond its capacity. And when you speak, be fair, even if it concerns a close relative. And fulfill your covenant with God. All this He has enjoined upon you, so that you may take heed. This is My path, straight, so follow it. And do not follow the other paths, lest they divert you from His path. All this He has enjoined upon you, that you may attain piety." (6:151-153). The Quranic prohibitions are summarized in this verse: "Say, "My Lord has forbidden immoralities-both open and secret-and sin, and unjustified aggression, and that you associate with God anything for which He revealed no sanction, and that you say about God what you do not know."" (7:33). We told him that in these verses, God prohibits that one would ascribe words or laws to Him that He never mentioned in the Quran at all; thus, the ones who issued fatwas of prohibiting listening to female singers under the pretext that their voices instigate fornication are committing a sin of adding laws never endorsed by God. female singing is never a sin nor does it arouse sexual desires, and even if some countries have laws to stop and censor songs with lewd words, this is not part of Quranic laws. Even in case when some songs contain lewd innuendoes, this is a small mistake, not a grave sin, that God will forgive for those who avoid committing major, grave sins; no one is immune against small mistakes and mishaps, and the winners are those who repent from them; God describes good, pious ones in this verse: "Those who avoid gross sins and indecencies - except for minor lapses - your Lord is of Vast Forgiveness..." (53:32). We said to this man that the definition of "minor lapses" in Sunnite books is so many things that make sexual singing appears as nothing in comparison. The man raised his voice when he told us that it is much better to listen to religious singing and Sufi poetry lines set to music that praise and glorify God. We retorted that he does not understand Islam yet; singing without sexual innuendoes is OK in Islam, whereas in cases related to religious rites and acts of worship, one must adhere to the Quranic sharia legislations related to them, NOT to follow our whims and desires regarding them. For instance, the act of worship by the remembrance of God's name in glorification has a certain way described in the Quran: "And remember your Lord within yourself, humbly and fearfully, and quietly, in the morning and the evening, and do not be of the neglectful." (7:205). Thus, it is very wrong to turn this remembrance into loud singing in groups or alone within religious festivals or feasts like Sufis who dance and sing. This is against the real fear of God within pious people's hearts when they remember and glorify God: "The believers are those whose hearts tremble when God is mentioned..." (8:2). Thus, to turn this type of remembrance that should be done reverently, quietly, and humbly into loud singing with or without music is violation against God's Quranic laws and the awe of God: "Call upon your Lord humbly and privately. He does not love the aggressors...and pray to Him with fear and hope. God's mercy is close to the doers of good." (7:55-56). Thus, how could we apply this with Sufi dancing and 'religious' singing?! Indeed, their practices are grotesque and irreligious. Even Zachariah invoked our Lord God in the right manner: in private and in low voice; he did not organize a choir of singers behind him within litanies or hymns: "A mention of the mercy of your Lord towards His servant Zechariah. As he invoked upon His Lord in private, in murmuring voice." (19:1-2). Thus, Sufi dancing and 'religious' singing are mockery of God and introducing jests and playfulness instead of reverence and awe. Prophet never danced or singed as a way to worship our Lord God. we told this man that when he would be in real trouble, he would invoke God for deliverance with tears in his eyes, not while dancing and singing. We drew another example to him; if his own son would come to him singing and playing musical instruments (esp. drums and flutes) along with his friends to ask for something from him, he would consider this as an insult and mockery. Why would we accept this mockery and ridicule to be as means to invoke and remember God as if in an act of worship, then?! Thus, it is funny and laughter-inducing that Sufi Sunnites turn acts of worship into singing, dancing, and whirling sessions of musical parties while they prohibit ordinary secular singing as if it were sinful. The man remained silent, and we told him that it is better for him to treat us as a tutor/teacher and he must play the role of our student to learn from us instead of verbally attacking us in a vulgar manner at our own office at home. Without uttering a single word, this man felt ashamed of himself and he left our house, never to return again, or like what Fayrouz says in her song: Shadi is lost! Based on this true story, we have written this above article and published it in the independent Cairo-based Al-Ahrar newspaper on 2nd of December, 1991, within our column titled (The Narrator Has Said). We assert in it that ordinary singing, as a form of art, is legal and never prohibited in Islam. Even if some songs contain lewd words of sexual innuendoes, this is a small mistake and not a grave sin at all. What is strictly prohibited in Islam is the so-called religious singing, as it turns acts of worship into mere jest and playfulness. After the passage of 17 years when we first published this article, we have received an email message from a website calling to prohibit ordinary singing and to replace it with 'religious' singing. This website that sent us this message is called (The Passage to Paradise); as if owner(s) of this Salafist website were the one(s) deputized by God to confiscate the knowledge of the path or passage to Paradise and to spread news of it to others! It is as if no one else has the right to enter into Paradise except through their Salafist website! It is as if this Salafist website were a new prophecy or religion descended from heaven, with a map (never given to Muhammad) leading to Paradise! We think we now know why Arabs are regressive and obscurantist while others are progressive. Do you know now why Shadi is lost? !